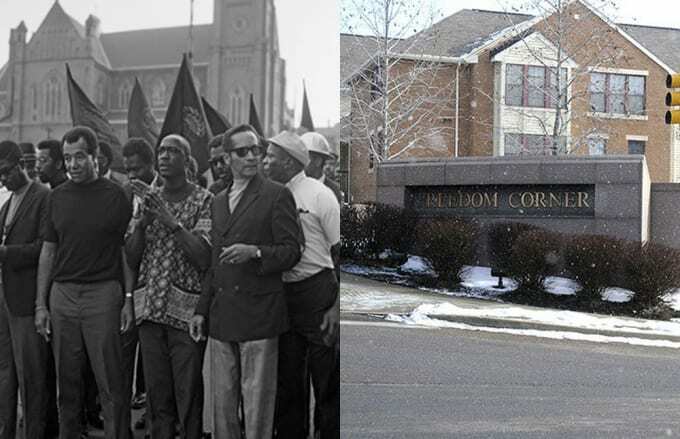 Located at the intersection of Centre Avenue and Crawford Street in Pittsburgh, Freedom Corner earned its name when it served as the meeting place for a protest of the destruction of the Hill District, the city's black neighborhood (the birthplace of Pulitzer-Prize winning playwright August Wilson). It then became the rallying point for all subsequent marches and protests by the black community in Pittsburgh, and was the point of departure for protesters traveling to D.C. for the March on Washington. Today, a monument rests on the corner to honor the freedom fighters of the past. The monument is inscribed with the names of leaders, and also features a chronological history of the movement.